At the beginning of summer, my boyfriend and I moved into our first home. We spent the early months dwelling in near empty rooms, gaining familiarity with the space before taking paint to the walls and opening our wallets for furnishings. While the task of making a house into a home felt initially overwhelming, the choice to step back and pause for breath has made the project enjoyable. Our house came with its own personality, including a unique blend of blonde wood trim, bronzed hardware, and ornate light fixtures. While the personality may not match our own preference for modern, we are finding a way to blend our disparate styles together. We have made design mistakes along the way—the two coats of "bunglehouse blue" paint in the office was quickly repainted with the original color in a short 24 hours, so grave was the error in judgement—but these failures have only led to a better understanding of the space where we live. Observing the changing of the seasons through our living room window has become my favorite part of living in our new home. Summer brought bright, hot sunlight and bold green hues. Autumn came in shades of yellow, the intense leaves fading in color and falling until only bare branches remain. While I hope winter is still weeks away, we have caught glimpses of what it may hold, with diffuse light reflecting off the snow and filling the room with a quality of light reminiscent of cloudy mornings in the rocky mountains. 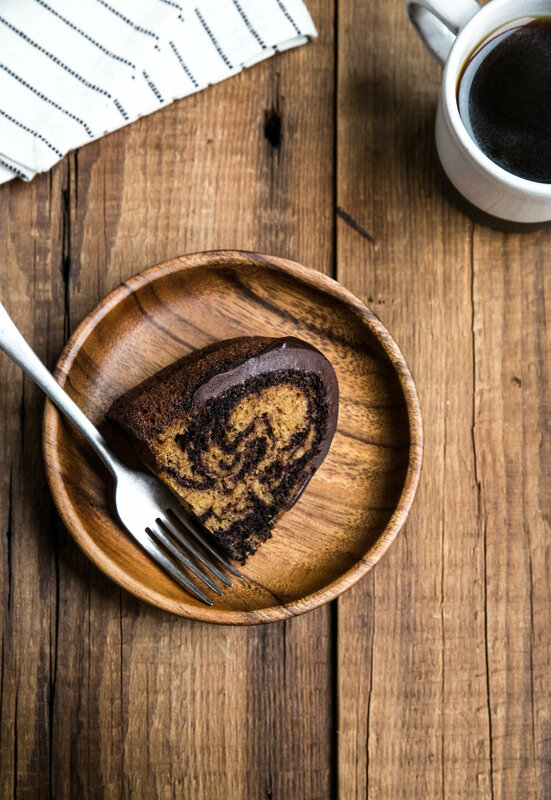 On one such morning, with soft light filling the home, I set out to create this marbled pumpkin chocolate cake. Back when I was working in a bakery, one of my favorite snacks was to pipe chocolate frosting onto the pumpkin scraps leftover from leveling the cake, sealing my love for this flavor combination. The bundt cake features pumpkin and chocolate cake marbled together, with a thick chocolate glaze as the icing on top. While my baked goods are typically sent to work and enjoyed by coworkers, we kept "forgetting" to bring this one with us. This cake carries the seasonal flavors beautifully. While it is perfect for sharing with friends and family, I would understand if you want to keep this cake close to home, too. 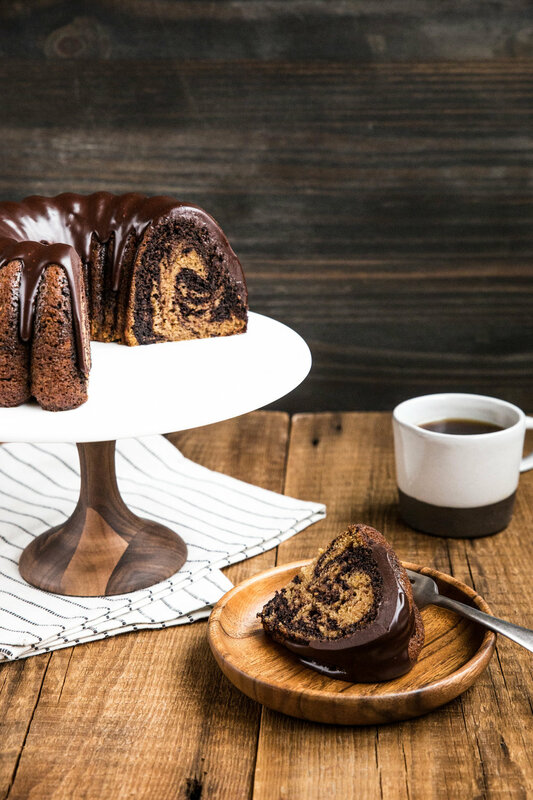 This Marble Pumpkin Chocolate Cake blends together fall flavors and chocolate in this bundt. Alternate spoonfuls of pumpkin and chocolate cake batter are place in a cake pan and swirled with a knife to achieve a marbled look. Once baked and cooled, the cake is covered in a rich chocolate glaze. Due to the moisture in the pumpkin, the cake stays fresh for several days. Serve alongside a cup of hot coffee or a mug of warm cocoa. For the pumpkin batter, beat together the pumpkin, eggs, oil, brown sugar, granulated sugar, and vanilla extract in a large mixing bowl until well blended. Stir in the flour, baking powder, baking soda, spices, and salt until smooth and uniform in appearance. Set aside. For the chocolate batter, whisk together the cocoa powder, granulated sugar, and strong coffee in a medium mixing bowl. Add in 1 1/2 cups of pumpkin batter and stir until uniform. Set aside. In the prepared baking pan, alternate spoonfuls of pumpkin and chocolate batter. Using a knife, swirl the batter by making an "S" shape once around the pan to create a marbled texture. Bake for 50-60 minutes, or until a toothpick inserted into the center comes out clean. Allow cake to cool in pan for 15 minutes before un-molding transferring to a cooling rack to cool completely. For the glaze, heat the heavy cream in a small saucepan until steaming. Immediately remove from heat and pour over chopped chocolate, allowing the chocolate to melt for 5 minutes before stirring until smooth and uniform. Allow glaze to cool until it reaches a thicker consistency. When cake has completely cool, pour glaze evenly over the top. Serve after the glaze has fully set.